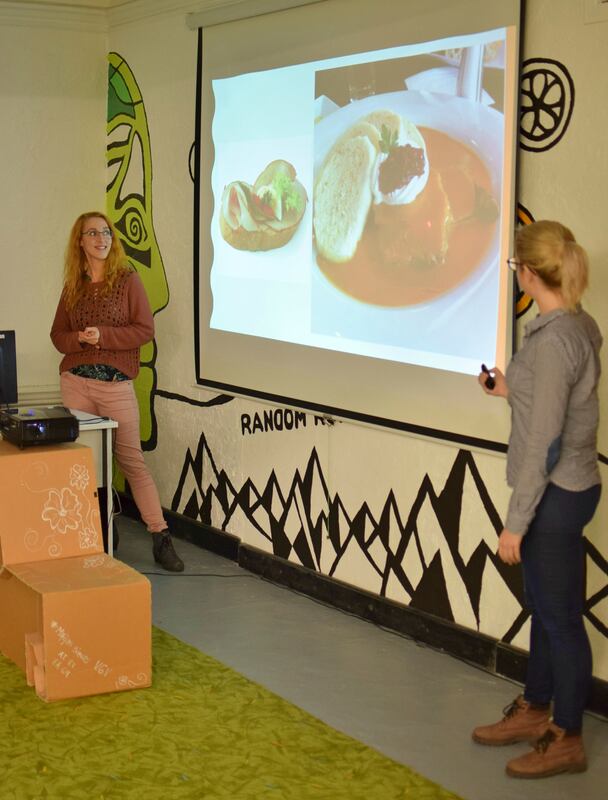 The Cultural Talk Evening was an initiative that came from the 2 EVS volunteers that work at the Ventspils Youth house. They invited other 3 volunteers to join them, and in total we had 5 nationalities (because one of them has double nationality) Portuguese, Spanish, Czech, Italian and Slovakian. The main idea was to show to the locals how youngsters from different countries and with completely different culture see their nations. They showed what they think about their homes, their culture and they also gave some tips and share opinions about the places to visit and the “must do” activities. It was a talk club, so it means that the listeners also participated and shared opinions, experiences and asked questions. In the end there was a table full of traditional food waiting for everyone, where we could find “Nutella cheese cake” from Italy, “Potato Pancakes” form Czech Republic, “Chorizo Snacks” from Spain and “Salame de Chocolate” from Portugal. To make everything better, there was a small moka machine strait from Italy with Italian coffee as a plus that everyone could use or learn how to use and enjoy the tasty flavour of good coffee.